This Deora is a $1 garage sale rescue. As you can tell by the photo of the box someone used it for BB gun target practice with the kit still inside the box. Quite a bit of body work to get it in shape! The color is a weird paint mixing experiment gone wrong Gang Green with clear pearl overcoat. The matching 90's Deora was done as a sheer need to NOT pass up a $3 closeout bargain. 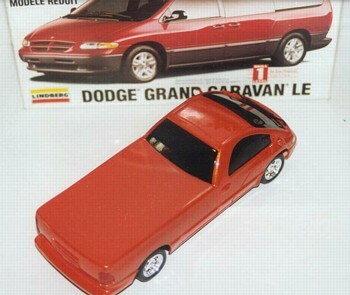 I have done another version of this vehicle as a 90's Little Red Wagon. 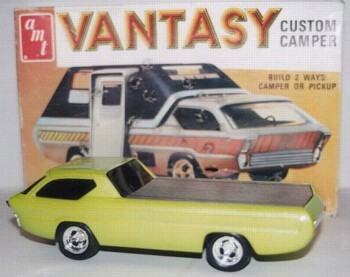 This version was done as an updated version of the original Deora hence the stock appearance. The color on this one is Boyd's Roadstar Orange over Testors Hot Rod Orange base coat with a light misting of clear pearl and lots of Testors High Gloss Clear again from a heated shakey can.